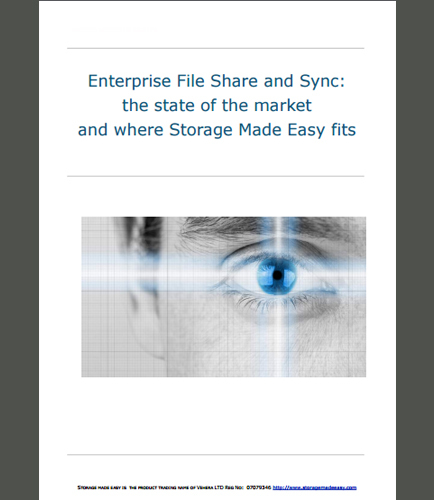 "Evaluating the Enterprise File Share and Sync (EFSS) Market"
Evaluation of the Enterprise File Share and Sync (EFSS) Market gives an overview of the market from a different perspective and also an outline of how the private Enterprise File Share and Sync solution fits within this market. Why use Enterprise Grade File Sync and Share (EFSS) solutions over CFSS systems? CFSS systems can bypass corporate data loss prevention (DLP) systems, increasing the likelihood of data breaches. Use of CFSS systems has become the key element of the “Shadow IT” and “ Consumerized IT”, which are the major issues faced by organizations today. EFSS tools allow content to be managed by senders and by IT with various capabilities, like making the content available only for a limited time or accessible only by authorized individuals. A key distinction between EFSS and CFSS tools is where primary control over corporate content is managed, while still enabling users to work with data as they need. Why do we need to deploy Enterprise Grade File Sync and Share (EFSS) solutions over CFSS systems? According to the survey, 19% of the organizations have replaced CFSS tools with EFSS alternatives. Does replacing Consumer-focused file sync and share (CFSS) solutions with EFSS solutions enable efficiency in managing corporate information? This whitepaper discusses the problems caused by the use of CFSS tools and how the use of enterprise file sharing and synchronization solutions will mitigate the risks associated with CFSS solutions. IT control is changing…and not for the better. This whitepaper guides you on: Why it is important to deploy EFSS tools as an alternative to CFSS systems? How IT has lost control over corporate content because of the growing use of CFSS tools, that has increased corporate risk? What are the problems with consumer file sync and share solutions? How do organizations share files today? How common sync and share solutions increase sharing data through cloud storage? Importance of Considering Latency, Bandwidth and Reliability of Network Connectivity in EFSS and CFSS Solutions What are the various data sovereignty issues? How to use EFSS tools to dramatically lower corporate risk by keeping corporate information assets under the control of IT? Download this whitepaper to understand the depth of the problems faced by organizations using CFSS solutions and focusing on implementation of EFSS solutions as a replacement for CFSS solutions.